Vitamin A metabolism in small IECs cells is affected by dietary intake. (A) aldh1a1 mRNA expression measured in total SI and epithelial scrapings from the SI. C57BL/6 mice were raised on a standard conventional diet or a synthetic AIN-93M diet. (B) The expression levels of aldh1a1 mRNA in proximal, middle, and distal parts of the SI. The levels were normalized to Ubiquitin and Cyclo mRNA levels. Relative mRNA expression levels of proximal SIs of mice fed a conventional diet were set at 1.0. ALDH activity was measured by flow cytometry in MLN DCs gated first for CD11c+CD45+ cells, followed by CD103+ expression on the forward scatter (FS) (C) and in MLN CD103−CD11c+ DCs (E) using the ALDEFLUOR assay in the absence or presence of ALDH inhibitor DEAB. (D) Percentages of CD103+ and CD103− CD11c+ DCs in the MLN. 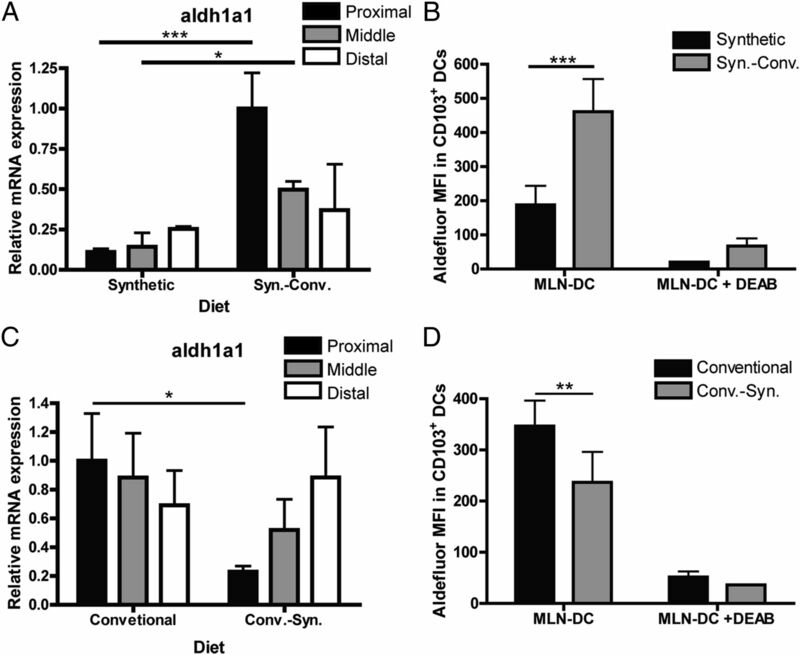 (F) Bar graphs show ALDH activity measured in MLN CD103+ DCs of mice that received 4,000 or 20,000 IU/kg vitamin A in the diet. (G) FACS plots (left panels) and bar graphs (right panels) of the percentages of Foxp3+ T cells (CD45+CD4+CD3+) in the SI of mice raised on a synthetic or conventional diet. 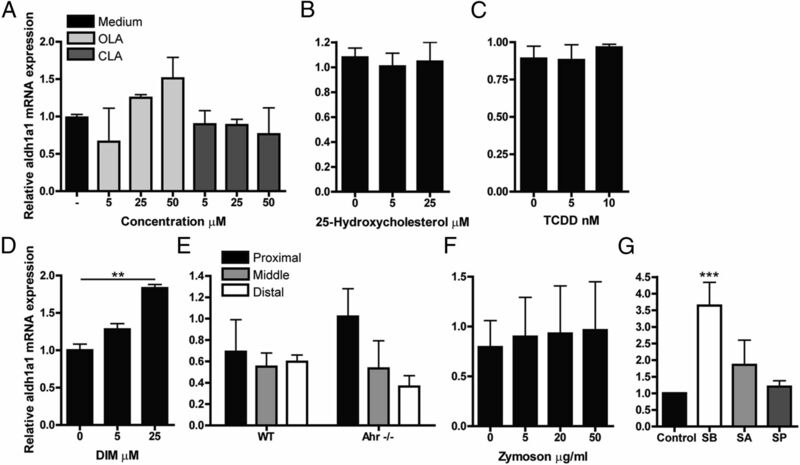 (H) Concentration of secretory IgA (microgram per milliliter of PBS-dissolved content of the SI) in mice raised on a synthetic or conventional diet, as analyzed by ELISA. Five or six animals were used per group in two separate experiments. *p < 0.05, **p < 0.01, ***p < 0.005. Temporary dietary changes can affect vitamin A metabolism within the SI. (A and B) C57BL/6 mice were raised on a synthetic AIN-93M diet until 10 wk of age, after which they were switched to a conventional diet or remained on the synthetic diet for 3 wk. (C and D) Additionally, C57BL/6 mice, raised on a conventional diet until 17 wk of age, were switched to a synthetic AIN-93M diet or remained on the conventional diet for 5 wk. In (A) and (C), expression levels of aldh1a mRNA in proximal, middle, and distal parts of the SI were determined by real-time PCR, upon normalization to Ubiquitin and Cyclo mRNA levels. At the end of the experiment, relative mRNA expression levels of proximal SI of mice that received a conventional diet were set at 1.0. In (B) and (D), ALDH activity was measured by flow cytometry in MLN CD103+CD11c+ DCs using the ALDEFLUOR assay, in the absence or presence of ALDH inhibitor DEAB. Six animals were used per group. *p < 0.05, **p < 0.01, ***p < 0.005. Expression of aldh1a1 enzyme in mICcl2 epithelial cells can be induced by a natural Ahr ligand and SCFA butyrate. The mICcl2 small IEC line was stimulated for 24 h with various dietary- or microbiota-derived products and analyzed for aldh1a1 mRNA expression of conjugated linoleic acid (CLA) and oleic acid (OLA) as an appropriate control (A), 25-hydroxycholesterol (B), synthetic Ahr ligand TCDD (C), natural Ahr ligand DIM (D), fungal cell wall component zymosan (F), and the SCFAs sodium acetate (SA), sodium butyrate (SB), and sodium propionate (SP) (G). The medium control was set at 1.0 for all in vitro stimulations. (E) Expression levels of aldh1a1 in proximal, middle, and distal parts of SIs from WT and Ahr-knockout mice; mRNA levels were set at 1.0 in the proximal SI of WT mice. The expression levels of aldh1a1 mRNA were analyzed by qPCR and normalized to those of Ubiquitin and Cyclo. In vitro experiments were repeated three to seven times; in vivo experiments included six mice per group. **p < 0.01, ***p < 0.005. 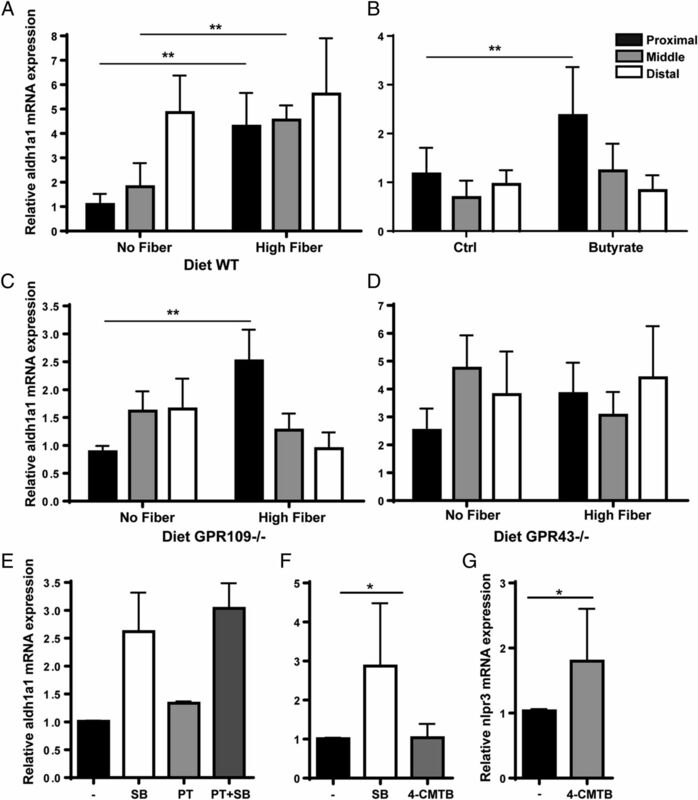 High-fiber diet induces vitamin A metabolism independently of GPR signaling. (A–D) Mice were raised on a synthetic AIN-93 control diet (3.2% fiber) until 8–10 wk of age. Subsequently, diets were switched to ones that contained no fiber and high levels of fiber (35%) for 2 wk. WT C57BL/6 mice (A), GPR109−/− mice (C), and GPR43−/− mice (D). (B) Moreover, WT C57BL/6 mice received sodium butyrate (SB; 100 mM) for 3 wk in their drinking water. SIs were collected, and expression levels of aldh1a1 in proximal, middle, and distal parts were measured; mRNA levels were set at 1.0 in the proximal SI part of WT mice that received the no-fiber diet. Five or six animals were used per group. (E) mICcl2 were analyzed for aldh1a1 expression after a 30-min incubation with pertussis toxin (PT) before SB stimulation for 24 h. Stimulation of mICcl2 cells with 4-CMTB were analyzed for aldh1a1 (F) and nlpr3 (G). mRNA expression levels of aldh1a1 and nlpr3 were normalized to those of Ubiquitin and Cyclo. In vitro experiments were repeated three to eight times; in vivo experiments used six mice per group. *p < 0.05, **p < 0.01. 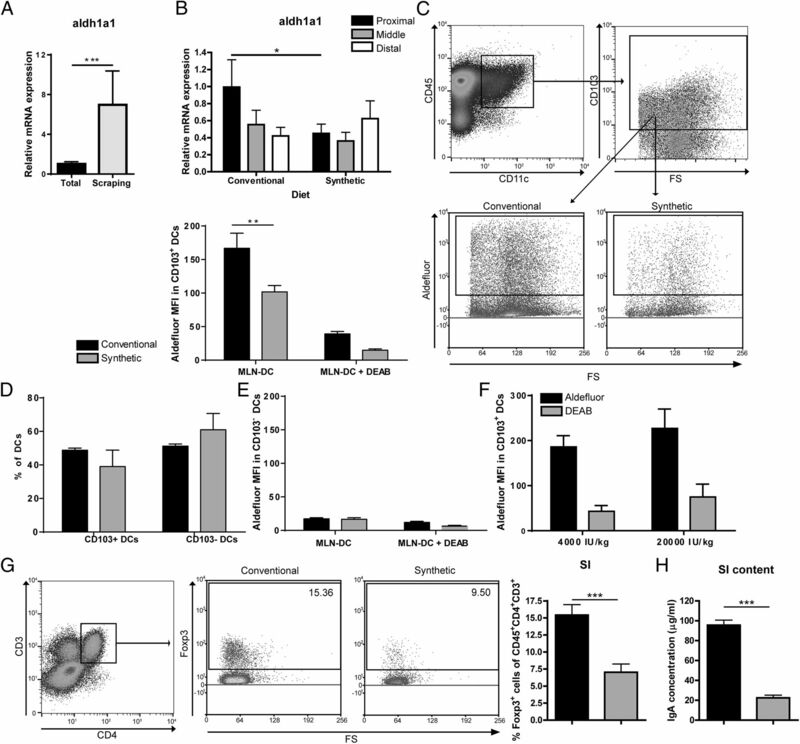 Expression of aldh1a1 enzyme in mICcl2 epithelial cells can be induced by specific HDAC inhibition. 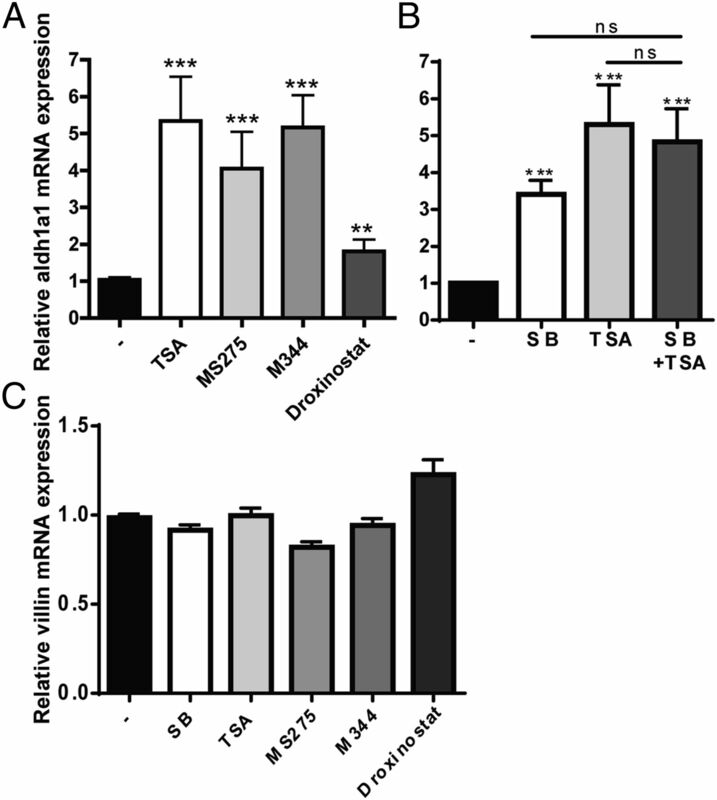 (A) aldh1a1 levels of mICcl2 cells stimulated with the HDAC inhibitor TSA, MS275, M344, or Droxinostat for 24 h. (B) aldh1a1 levels of mICcl2 cells stimulated with sodium butyrate (SB), TSA, and SB+TSA. (C) villin levels of mICcl2 cells stimulated with SB, TSA, MS275, M344, or Droxinostat. The medium control was set at 1.0 for all in vitro experiments. All mRNA expression levels of aldh1a1 and villin were analyzed by qPCR and normalized to those of Ubiquitin and Cyclo. In vitro data are representative of four to seven experiments. **p < 0.01, ***p < 0.005. ns, not significant. 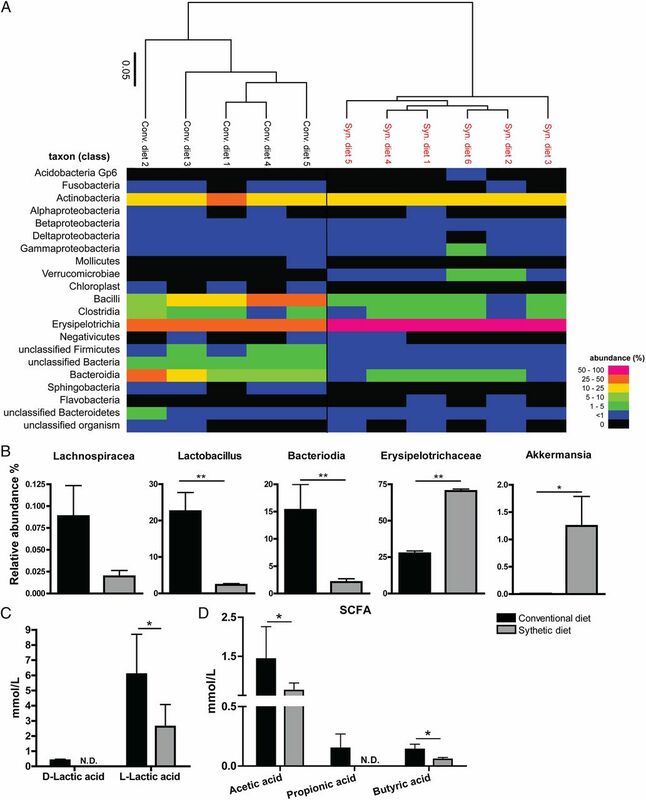 Composition of the microflora within the SI of mice raised on conventional and synthetic diets. The composition of the microflora within the SIs of mice, raised on a conventional or synthetic diet, was analyzed with the use of a barcoded amplicon pyrosequencing technique. (A) Relative abundance of bacterial classes detected in each stool sample, represented as a heat map. (B) Measurements of specific bacteria in mice fed a conventional diet or a synthetic diet. The concentrations of two isomers of lactic acid (D-lactic acid and L-lactic acid) (C) and SCFAs (acetic acid, propionic acid, and butyric acid) (D) were measured within the content of the SI. Five or six animals were used per group. *p < 0.05, **p < 0.001. N.D., not detected.